The principle of always remembering Krishna and never forgetting Him is the essence of all other instructions given in the shastras. Shastras describe many rules and regulations governing all the different areas of human life. The idea of all these rules is to gradually bring everyone to the point of pure and constant rememberance of Krishna, which is the original and natural position of every living entity. Until we come to the stage of such pure Krishna consciousness, we have not actually fully realized the potential of our human life. The principle of always remembering Krishna is realized through engagement in direct devotional activities – hearing about Krishna, chanting His name, attendance of temple programs, cooking for Deities etc. If we are able to always be engaged in those activities, we automatically never forget Krishna, and it is such rememberance that will develop our love for Krishna and bring us back to Godhead. However, for many devotees, especially in the beginning of our Krishna consciousness we still have many other attachments and engagements. 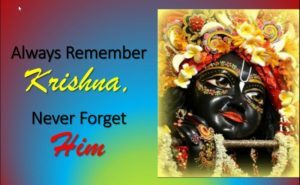 So in order to never forget Krishna we should endeavor to connect them to Krishna’s service. For example, if we are always remembering Krishna, we will cook for Him preparations that He likes, as described by the acaryas. But if we have a desire to eat something else, we should at least not forget Krishna and offer that preparation to Him. Then we will gradually be purified. In general it can be said that in the beginning of our Krishna consciousness endeavors to not forget Krishna are more prominent, as we are struggling with many material desires. Then, as we become more and more purified, the direct activities of always remembering Krishna take more prominence. Coming to the stage of always remembering Krishna through direct Krishna conscious activities we will automatically never forget Him and gradually achieve the perfection of pure love for Him.